In early 20th-century St. Louis, Pearl Curran claimed to have conjured a long-dead New England puritan named Patience Worth through a Ouija board. Although mostly unknown today, the resulting books, poems, and plays that Worth “dictated” to Curran earned great praise at the time. 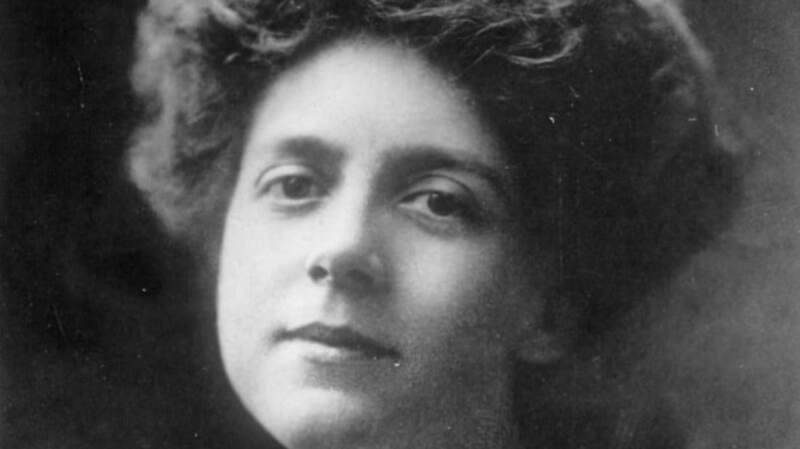 Ed Simon investigates the curious and nearly forgotten literary fruits of a “ghost” and her ghostwriter. On July 8th 1913, after months of experimentation, a St. Louis housewife named Pearl Curran finally had a breakthrough with her Ouija board. From this initial correspondence, Pearl Curran wrote (or depending on your perspective, transcribed) millions of words she attributed to a seventeenth-century poet who called herself Patience Worth. Historical novels, religious tracts, and lyric poems were published and embraced by mainstream scholars as authentic examples of early American literature mediated from beyond the grave. The figure of Patience Worth was commended as an exemplary writer by organizations such as the Joint Committee of Literary Arts of New York. She was included in journals alongside such future canonical authors as Edna St. Vincent Millay and she appeared in collections such as the Anthology of Magazine Writing and the Yearbook of American Poetry. All the more amazingly, readers and critics agreed that this was new work by a woman who claimed to have been dead for more two and a half centuries. These writings were either authentic documents that provided astounding evidence of humanity’s survival after death, or an intricate and impressive hoax that hoodwinked scholars, critics, and editors. There is also another possibility, that these works were the improvisational literary productions of a prodigy who believed herself to be a conduit of some muse from the hereafter. Questions of authorship and intention aside, what remains are the books, plays and poems – once popular literature, and now forgotten. Curran’s output prompts us to ask some fundamental questions about history, genre, intention, affect, authorship, and why we choose to read what we read. Furthermore, her writings are a fascinating curio of an era in American literary history when academics and quacks, the rational and the occult, scholarship and magic all mingled together in popular discourse. Pearl Curran was born in 1883, towards the end of a century that saw the national landscape and the United States’ position in the world radically altered. She and her audience were inheritors of the sometimes bizarre religious diversity of the American nineteenth century. It was a century that began with the religious anarchism of the Second Great Awakening, was defined by an apocalyptic Civil War, and then moved into the bourgeois and respectable spiritualism of the late Victorian era. Occult experimentation was embraced by leading thinkers and writers like William James who, with other leading scientists, founded the American Society for Psychical Research. Curran was enmeshed in a culture of esoterica that she would have encountered during a Victorian adolescence. And the figure of Patience Worth “revealed” herself at a perfect time, just as the rising international power that was the United States began to critically re-evaluate its seventeenth century Puritan origins. Colonial American writings were long dismissed as embarrassing anti-intellectual relics by great nineteenth-century authors like Ralph Waldo Emerson and Nathaniel Hawthorne. In the early years of the twentieth century however, scholars began re-evaluating the seventeenth-century canon. Pearl Curran supplied a perfect model in her creation of Patience Worth, who was included alongside actual poets as an example of colonial American artistic genius. As the United States began to assert itself on a global stage, it looked back towards its then agreed upon New England origins and began to refine its creation myth, extolling the virtues of Puritan thrift, industriousness, and individuality. Importantly for Curran, the colonial period was also one where women’s voices were surprisingly not ignored. In early American poetry the seventeenth-century poet Anne Bradstreet (1612-1672) dominates as the single most exemplary and important literary figure. Other women writers like Mary Rowlandson (1637-1711) were the Puritan equivalents of best-sellers. This newfound enthusiasm for colonial American letters arrived at a perfect time for Curran. Indeed, the relative respect that colonial women writers like Bradstreet received dovetailed well with the feminine realm that was the early twentieth century séance. As Gioia Diliberto makes clear in her excellent introduction to the Patience Worth phenomenon, “Patience Worth: Author from the Great Beyond”: “Soon, scores of self-anointed mediums… burst on the scene, most of them women, whose passivity and purity, it was believed, made them ideal vessels to receive news from the Other Side.” It’s possible to view Curran as a native literary genius who, unable to promote her own authentic voice, is forced to invent a fictional persona that operates as her literary mask. Indeed, this is often how the case of Patience Worth is read. It’s not without precedent. From the Fox sisters of upstate New York to Madame Blavatsky, the séance has often been a woman’s game, able to supply a distinctly feminine voice when the larger society would not otherwise listen. 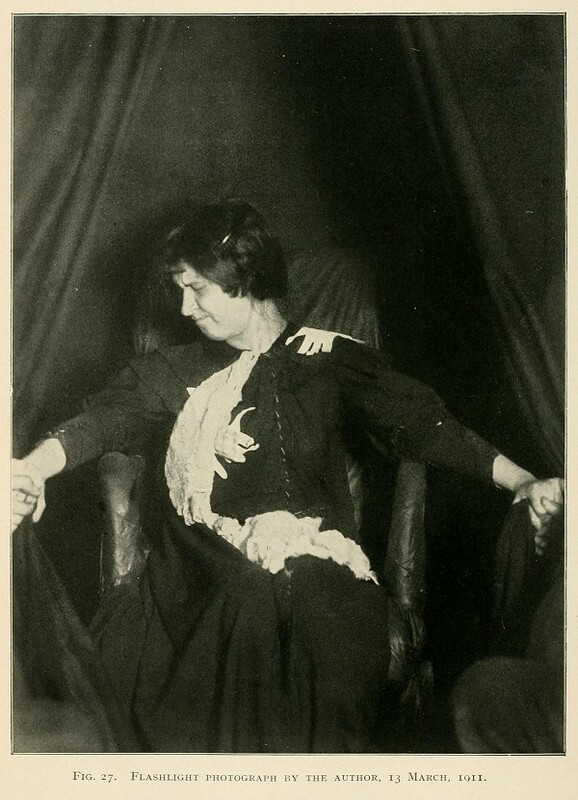 Photograph of French medium Eva Carrière at work, strewn with “ectoplasm” from the “other side”. Featured in Phenomena of Materialisation by German physician and psychic researcher Baron von Schrenck-Notzing, published in the same year that Pearl Curran was to have her first contact with Patience Worth – Source. It is certainly possible to see Patience Worth in these terms. But it’s limiting to exclude other possible interpretations of this strange corpus. Curran cannot be seen as just another literary-minded medium. Her case was different. Mediums like Blavatsky strongly delineated between their own writings and the short passages attributed to spirits. Curran, however, produced an incredible number of writings, all of which were attributed to Patience Worth. There are scores of poems, letters, and novels including Telka, The Sorry Tale, Hope Trueblood, The Pot upon the Wheel, Samuel Wheaton, and An Elizabethan Mask among other works. How should one consider the sheer amount and breadth of such works? If a hoax, it is still a hoax that is anything but simple, or easy. Although we do not need to explain such a prolific career framed in such a bizarre manner by suggesting that Patience Worth was a real person, there exists the possibility that Curran understood authorship in a more unconventional way than the wider culture frequently does. Between the possibilities of Patience Worth’s reality and Pearl Curran’s duplicity there exists a third option: that Pearl Curran transcribed these works believing Patience Worth to be real, a creation of her own mind communicating these words back to her. An internal muse if you will, whose existence serves to reevaluate the simple individual models of authorship we conventionally hold to. As such, her corpus provides an occasion for thinking about where inspiration comes from, how authors generate their writings, and the ways in which something as seemingly well understood as writing still contains a kernel of mystery at its core. Outside of occult circles, the embarrassing metaphysical nature of Patience Worth has relegated her to complete obscurity in the academic world for a century. There is not much respectability in the academic study of something that seems to be a hoax. This is an unfair fate for writings that, though not as technically proficient as works deemed canonical, still deserve study and attention, not just because of the way they illuminate an unusual period of American literary history, but also because the writings themselves are arguably more aesthetically proficient than one might expect. The critics who extolled the quality of Worth/Curran had their reasons for doing so, some of which still hold up. It should be emphasized again that these are not just short lyric poems that one could see a Ouija-using author writing in a few minutes. The sheer length of some of her books is astounding in itself, to say nothing of their literary quality. One need only flip through The Pot upon the Wheel, a verse play whose dialogue sometimes reminds one of the spiritual urgency of a classical religious text like the Bhagavad-Gita. Or take A Sorry Tale, a more than six hundred page esoteric account of the life of Christ that at points reaches a prophetic pitch calling to mind the theology of William Blake. 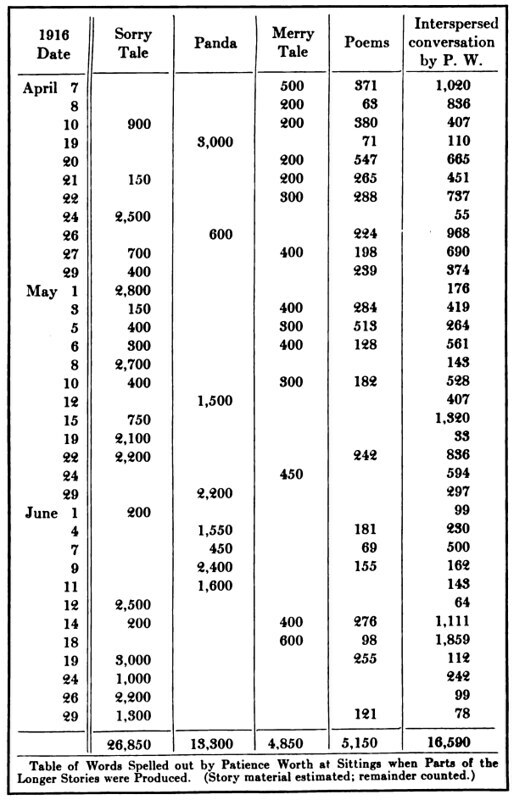 A table – featured in Walter Franklin Prince’sThe case of Patience Worth; a critical study of certain unusual phenomena (1927) – showing the huge volume of work that would be produced at a sitting – Source. Thankfully, this critical blind-spot is beginning to be rectified, with scholarly books like Daniel Shea’s The Patience of Pearl: Spiritualism and Authorship in the Writings of Pearl Curran, published in 2012, and the aforementioned Diliberto article in 2010. They provide an excellent overview on the particulars of the Patience Worth case, analyzing not just biography, but also the context that produced these writings, and their reception and their loss. When dipping into the voluminous corpus of writings, one of the first things you notice is that they don’t bear the haphazard stream-of-consciousness style so common in the automatic writing practiced by Dadaist poets and other Avant-Garde groups. But they also don’t read like seventeenth century American prose and poetry, despite what early critical advocates of Pearl Curran like Casper Yost may have claimed. At most, one could say that the works exhibit qualities of pastiche in their depiction of how American Puritans wrote and talked – though none of this should diminish the very real personality that seems to come through the communications of Patience Worth. Admittedly, she departs from Dickinson’s distinctive ballad meter which conjures the structure of hymn, but at least visually the poem calls to mind the short lyrics of the “Bard of Amherst”. While not particularly sophisticated, there are some notable elements: the rhetorical question that she leads with, the images of fire and ash, and the line, “It is the thing which remains” (particularly evocative of Dickinson). The most unfortunate aspect of the poem is its last line which reminds one of particularly poor translations of Rumi or Hafez, and also reflects so much of the orientalist theosophical milieu that Pearl Curran traveled in – certainly much more than it does seventeenth century Puritan American religious lyric. 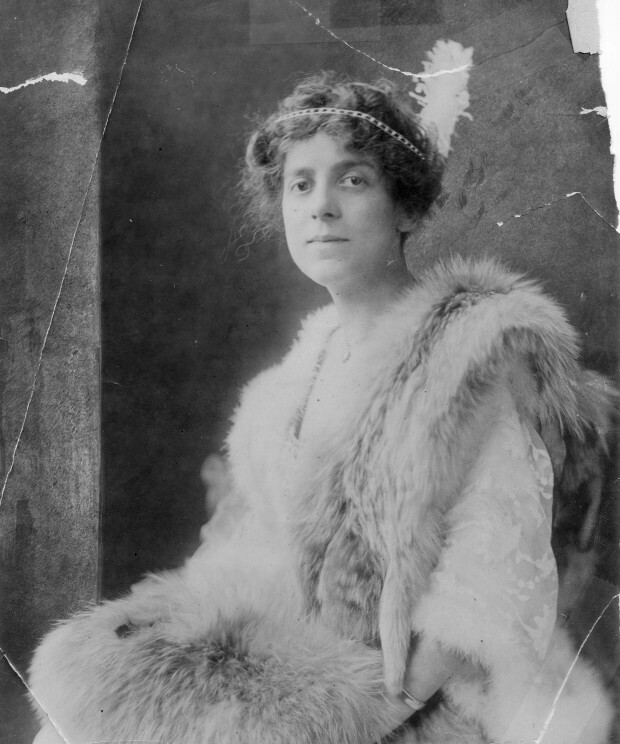 Pearl Curran in an undated photograph –Source [copyright unknown]. Ah, emptied Heart! The Weary o’ the path! How would I to fill ye up o’ love! With its declarations and its exclamation points she reminds us of Walt Whitman, even if she does not share his recognizable mighty lines. Stand grinning at the deathy day. In her depiction of an autumnal melancholy, she conflates nature with skeletal corpse images, a gothic personification similar to the memento mori tradition of the Puritanism she was supposedly an adherent of. Later, a lily is compared to a “brown-robed nun,” an entirely un-Puritan image in this strangely ecumenical religious world of Patience Worth. This same heterodox antinomian faith is evident in the title to her poem, “Predestined Love,” where one of the sternest doctrines of Calvinism is tweaked into one of universal love. As this brief reading has shown, there is much literary merit in Curran’s work – so why then this neglect? The bizarre origin of the writings shouldn’t be an impediment to a reasoned study of their structural qualities. After all, William Butler Yeats attributed several of his lyrics to a spirit named Leo Africanus whom he encountered through the use of a Ouija board while a member of the Hermetic Order of the Golden Dawn. Without suggesting that the writings of Curran and Yeats are of similar artistic value, it would seem that dismissing them entirely on the grounds that there is a connection to the occult is unfair if a similar standard isn’t applied to Yeats. In both of these cases it might be helpful to think of the mediated personalities as being complex heteronyms of a type exemplified by the Portuguese modernist poet Fernando Pessoa (a contemporary of Curran and one also fascinated by automatic writing and the occult). A heteronym is a particularly complicated pen-name; in addition to a false name there is an entirely false identity, a fictional writer where literariness is extratextual to the poem or book itself. These concepts, of the heteronym and the muse, inspiration and authorship raise interesting questions about the epistemology and ontology of literature. Where does literature ultimately come from? What is legitimate as an object of reading and study? Can a literary hoax still be read as literature? Left: A spirit photograph of Yeats taken, according to Stanford University, during a seance in Paris around 1914 –Source. 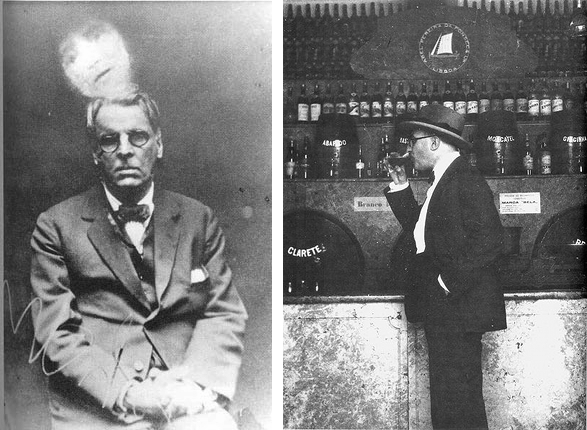 Right: Pessoa in 1929 taking a drink at Abel Pereira da Fonseca, Lisbon – Source. 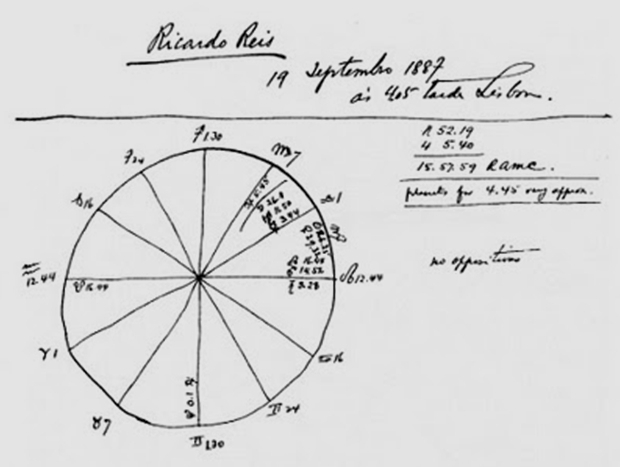 Astrological chart for Ricardo Reis, one of Pessoa’s heteronyms –Source. In the long view of cultural history, her place becomes even more interesting. Biography and history become compressed and the relationship between who is a real person and who is a fictional person becomes more ontologically uncertain. I’m going to break any sort of pose of objectivity and say emphatically that I do not believe that Patience Worth was anything more than a full-bodied creation of Pearl Curran. It’s worth pointing out that there are no records of any actual Patience Worth having lived either in New England, or Dorsetshire where Curran claimed the poet was born. Yet, imagine someone reading Curran a millennium from now. Would such distinctions as whether Worth is “real” or not matter to this imagined reader? For classicists there are arguments about the “reality” of an author named Homer, ones that scholars working in much later periods don’t have to consider in the same way. Philosophically, if a heteronym’s words seem as full and real as an actual person's, why can’t they be treated as such? The fullness of the fictionality of Patience Worth is that it is a fictionality which imposes itself on the real world, and that in itself is a fascinating act of literary creation. Explore more weird and wonderful history over at The Public Domain Review. Sign up for the free email newsletter to get the latest content direct to your inbox, and be sure to check out the very special book of essays. You can also follow on Facebook, Twitter, and Tumblr.